DADiSP 6.5 includes a number of exciting new features and enhancements. The majority of these changes and improvements are the direct result of customer requests and interaction. DADiSP 6.5 supports the display and processing of multi-column data plotted like a familiar stripchart recorder. Properties such as trace colour, axes placement and colour attributes are easily specified. Calculations on a stripchart extend to each trace and automatically yield a corresponding output stripchart. Load entire Datasets or any combination of individual Series into one or more stripchart views. The DADiSP MATLINK Module (included in DADiSP 6.5) provides a seamless interface for executing MATLAB code directly from DADiSP. DADiSP 6.5 processes any built-in or custom MATLAB functions or scripts just as if they were native DADiSP functions. MATLAB and DADiSP functions can be freely mixed and DADiSP 6.5 immediately plots series and array results from MATLAB. 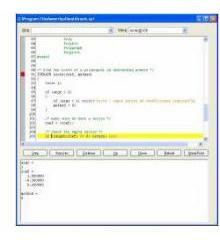 MATLAB Code Execution MATLINK, hot-links MATLAB code inside a DADiSP Worksheet such that dependent functions automatically update in response to source data changes. Enhanced rectangle, ellipse, polyline, polygon and text objects offer improved custom annotation capabilities to any data plot. Set text or shape properties with a mouse click. A powerful object-handle interface allows programmatic manipulation of any text or shape annotation. 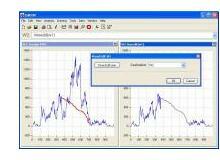 A mouse-based data editing and clipping facility supports freehand visual editing of any data Series. Manually remove outilers or edit specific sections of data with pen-like mouse movements and optionally limit data to a visually specified clipping line or clip box. DADiSP 6.5 extends SPL, DADiSP’s Series Processing Language, to provide both function and file based static and global variables. A new form based custom dialogue box facility enables the inclusion of GUI specifications and related SPL functions in one combined file. SPL’s C/C++ syntax offers a familiar and clean programming style allowing users to create SPL Debugger custom functions and procedures using standard programming techniques. DADiSP 6.5 provides a source-level, GUI based debugger to simplify the development of custom SPL functions and routines. The debugger offers one-click source line stepping and variable examination, on-the-fly expression evaluation and variable assignments, function and line based breakpoints, call stack manipulation and colour coded syntax highlighting of SPL source files. The DADiSP 6.5 Function Reference has been significantly expanded and enhanced. Examples from the on-line help files can be cut and pasted directly into a DADiSP Worksheet for immediate evaluation. Mathematical background information and algorithm details are provided for many functions and routines. 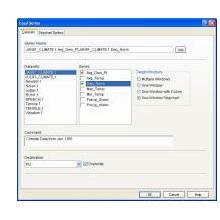 Load Series Dialogue Box Streamlined Dataset and Series interface allows any Dataset or combination of Series to be loaded into separate Windows or into a single Window as a multi-channel stripchart. Easily examine Series properties and select target Windows and stripchart plotting options from a uniform GUI. DADiSP 6.5 automatically adjusts the Worksheet or Window for maximum utilisation of a printer’s graphics capabilities. Add Worksheet title and footer labels to further annotate output results. Specify plot attributes such as colour, margin alignment, borders and text justification through simple Print Preview dialogues. 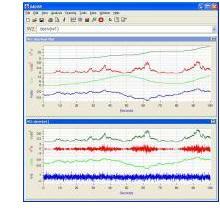 DADiSP 6.5 includes over 100 new built-in and SPL routines spanning the areas of matrix and series manipulation, signal processing, maths, colour, series generation, curve fitting and statistics. DADiSP 6.5 now offers over 1000 analysis routines with an intuitive and familiar user interface to provide one of the most comprehensive and easy to use data analysis tools available today.